Mark your calendars for some of the biggest and most anticipated events coming to Stockton, California in 2019. The most anticipated dining showcase in Stockton celebrates its 10th year in 2019! Discover your new favorite restaurant and stick to that new year's resolution to stay on budget with our 10-day celebration of local cuisine. Enjoy two-course breakfast & lunch and three (or more!) -course dinner menus at a fixed price from over 30 local restaurants! Vegan/vegetarian/gluten-free options may be available at some participating restaruants. View the growing list of diverse Stockton restaurants at StocktonRestaurantWeek.com and be sure to check back often as menus are added! If you've been dreaming of deep fried asparagus or always wanted to try asparagus ice cream, you're in luck because the San Joaquin Asparagus Festival is back in 2019! Start getting your taste buds ready now and bookmark to this page for updates on entertainment line up and more information. See some of the best college golf players in the West Coast compete during the Men’s Golf Championships at the picturesque Reserve at Spanos Park. This three-day event is FREE to watch, so plan to bring your golf aficionado friends to the course! 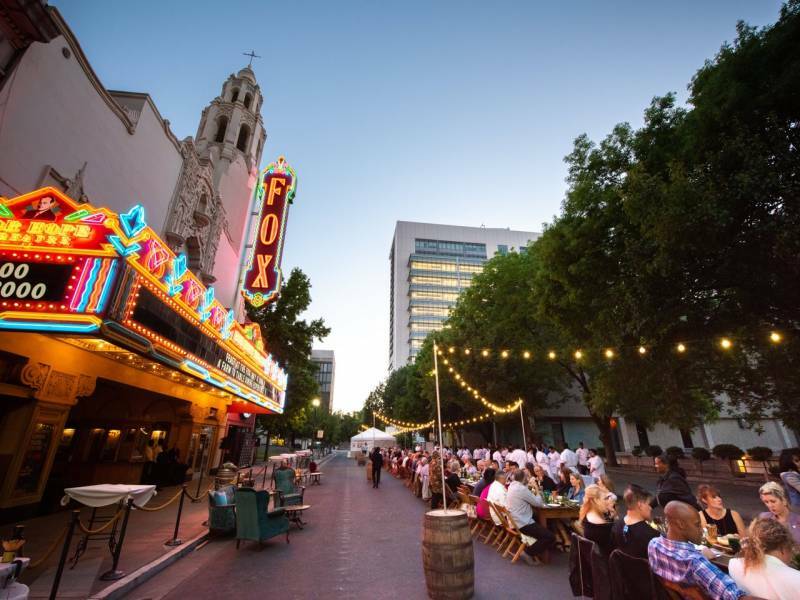 If you’re looking for a farm-to-table experience, the 2nd annual Feast at the Fox will be held outdoors along Main Street in Downtown Stockton. This exclusive dinner will feature an extraordinary five-course menu created by local chefs, and exclusively from ingredients harvested from farmer’s fields in San Joaquin County or sourced within 30 minutes of Stockton. Visit FeastAtTheFox.com for menu, updates and prices. Considered America's largest and most prestigious professional road cycling stage race, the Amgen Tour of California, will return to Stockton for the second year in a row in 2019! Downtown Stockton will serve as a start location for Stage 3 of the race as riders make their way to San Jose, California on May 14. Learn more. Back in Stockton for the seventh year, the West Coast Conference Baseball Championship is a great chance to see exciting baseball action. The Stockton Ports host these schools at the Stockton (Banner Island Ballpark) and invite baseball lovers to enjoy the fun. More information on tickets and times can be found online here. It is a privilege to have The Moving Wall return to our community in 2019. The Wall travels across the country, providing people an opportunity to honor those who lost their lives during the Vietnam War. It will be on display at Weber Point Events Center and will be free and open to the public 24 hours a day from June 20 to June 24, 2019. Learn more. Don't worry, beer happy! During Stockton Beer Week, various venues across Stockton work with breweries to create events that celebrate the local California craft beer industry. Last year we saw festivals, pub crawls, beer pairing dinners, the Brews & Shoes Walk/Run, and much more! Check out StocktonBeerWeek.com to for more. For its fourth annual Stockton Brew Fest, Visit Stockton announced its kick-off event for Stockton Beer Week will take place in a new location. Stockton Brew Fest will now be held outdoors at the Waterloo Gun & Bocce Club with nearly 100 of beers from over 30 breweries. The newly re-imagined event is a beer, music, and food festival that will allow you to sample more beer, listen to more music, and eat delicious bites from food trucks & vendors. Did we mention unlimited beer tastings?! Keep your eyes on StocktonBrewFest.com for details. Calling all pop culture fans--Get your geek on at Stockton's own version of ComicCon--StocktonCon returns for its eighth year at the Stockton Arena. This annual event has everything from comic books to celebrity guests, cos-play costume contests, vendors, and more. Start getting your costume ideas together now and find out more information about this event here. The fourth annual Stockton Arts Week is a 10-day celebration of our community’s diverse arts and cultural offerings. This city-wide event will highlight the vibrant art and culture Stockton has to offer by planning creative arts related events, such as: art walks, exhibitions, paint nights, demonstrations, performances, workshops, and much more! Check out StocktonArtsWeek.com for information on how you can get involved! Stockton will host the NCAA Men’s Water Polo Championship for the first time in program history as they compete at Chris Kjeldsen Aquatics Center beginning December 7 & 8 at University of the Pacific. Need more information? You can text us 7 days a week, 8am to 8pm at (877) 778-6258 and you'll receive a live response from a member of our team. Discover something to do in Stockton every day of the year by checking out our events calendar today! Also, follow us on Facebook, Twitter, and Instagram - and be sure to use #VisitStockton during your visit!